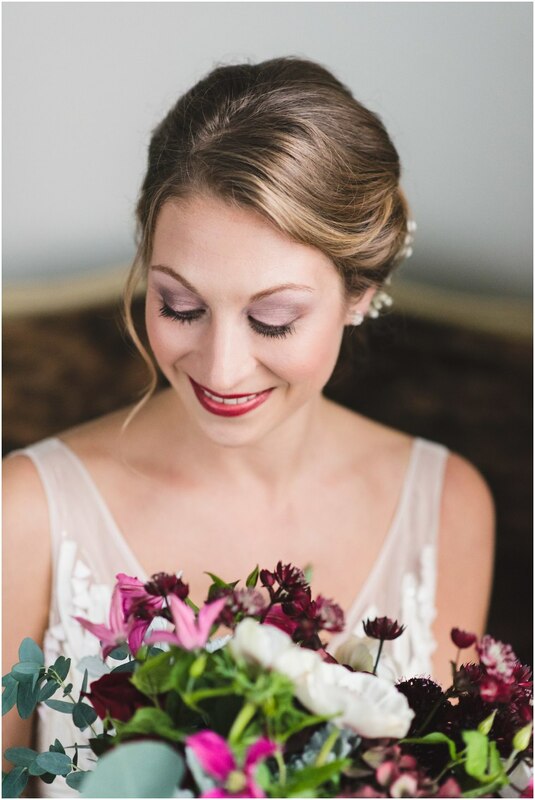 Today, I’m excited to share Amelia and Evan’s Burroughes wedding photos! Their romantic winter wedding, begins with a love story in Europe. How lucky are these two? A love story that started in France. Their winter wedding reminds me of a real life fairy tale. The stuff that dreams are made of. Magical pumpkins and fairy god mother type of dreams. A story about two people who met and fell in love in France! Evan is a Musician from the US who now lives in France with Amelia. They met while Amelia was watching him preform at a show in France. With my husband also being a musician, I can relate as I’ve watched many shows with puppy eyes from across the room. During our skype consult, Evan even commented on the make and model of my husband’s amp in the background. Amelia, with the help of her mom Karol did an amazing job planning the entire wedding from France. 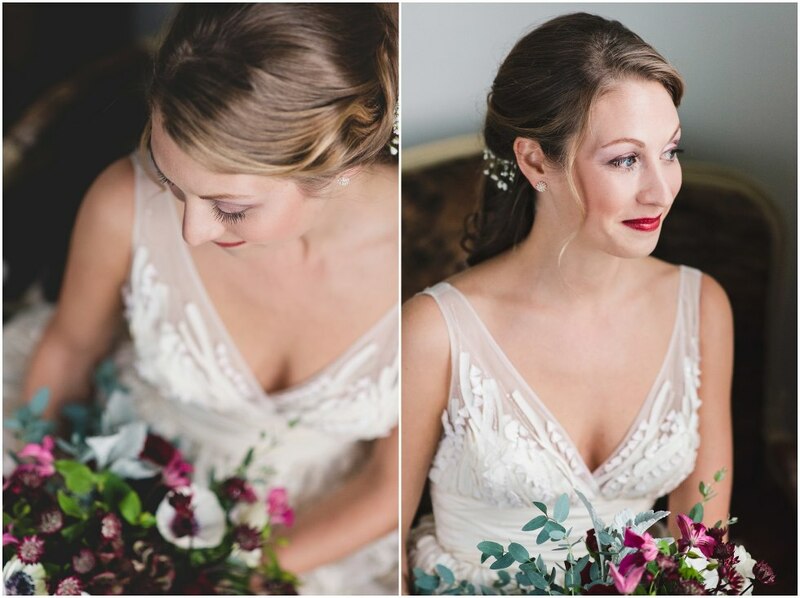 I’m still in utter amazement over how gorgeous her dress and bouquet was! 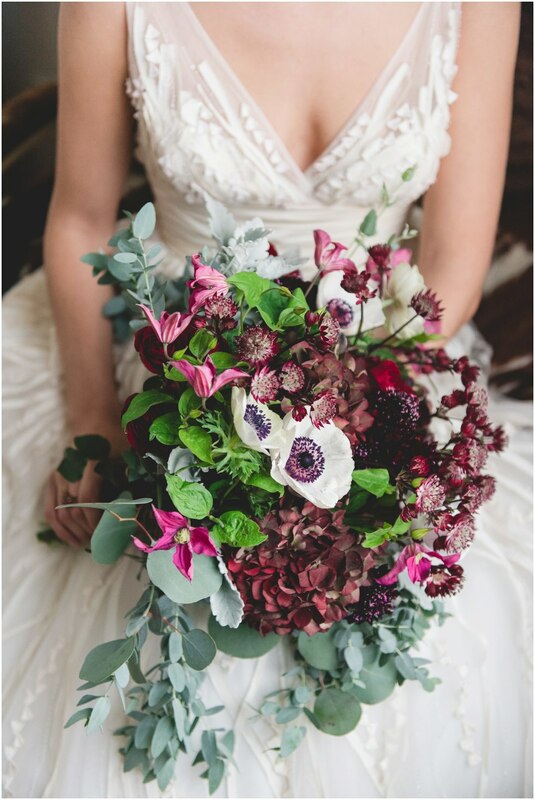 This wild, burgundy flower bouquet was created by Demarco Perpich Flowers. Evan and Amelia had their first look in the Burrough’s ceremony space, just before the guests arrived. Amelia shared her vision for the first look with me during our last planning meeting. With all the empty chairs and Evan waiting at the front, it was a very special and intimate moment between the couple. It felt like their own private ceremony, and it was so neat to see Amelia’s vision come to life. Amelia and Evan selected the Burroughes building for their venue because of it’s industrial and historical vibe. Centrally located in downtown Toronto, they knew it would be an accessible location for guests and family travelling for the wedding. This lucky bride and groom tied the knot just 3 days before Christmas. Amelia and Evan had a intimate and romantic winter wedding. Cedar garlands lining the tables, with rich gold and burgundy colours, and lots of twinkle lights.What a fantastic Christmas gift to be a new husband and wife. The ceremony began with Amelia’s uncle Garo officiating the wedding. I always think it’s so beautiful when family members are able to officiant a couple’s wedding. Don’t you? It often adds that extra, magical touch. After the ceremony there was not many dry eyes in the room! The reception followed the ceremony with a traditional dance called the Hanina. All the guests quickly joined in on the dancing fun and napkin waving. I also have a Lebanese background, so this was so neat to see! Food dudes catering did an amazing job serving up delicious appetizers, after which a mouth watering dinner was served up. Following Amelia’s and Evan’s first dance the party really began. Evan put together an especially funky playlist that kept the dance floor full throughout the night! Amelia and Evan’s Burroughes wedding photos were such a pleasure to capture. 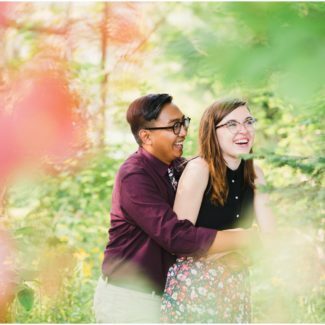 I’m so happy I got to meet and photograph this amazing couple. Wishing you a lifetime of happiness and adventures! If you love the wedding as much as I do, here’s a list of some of the vendors that were part of this fairy tale winter wedding in Toronto.